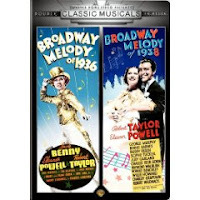 After viewing OUT OF SIGHT early this evening, I stepped back in time several decades to watch something completely different, BROADWAY MELODY OF 1936. BROADWAY MELODY OF 1936 was one of a very small handful of MGM musicals I'd never seen before. Although it boasts some wonderful moments, an excellent Freed-Brown score, one of my favorite leading men (Robert Taylor), and the great Eleanor Powell, overall the film was kind of...dorky, which is not an adjective I am in the habit of applying to MGM musicals. The plot concerns Robert Gordon (Taylor) who's looking for a leading lady for his new Broadway show. Irene (Powell), a girl Gordon knew back home in Albany, would love to try out for the chorus, but Gordon thinks Irene's all wrong for the tough New York scene and tries to send her back home to the safety of Albany. Meanwhile, Gordon's promised his financial backer Lillian (June Vincent) that if he can't find a leading lady in two weeks, Lillian can have the part. 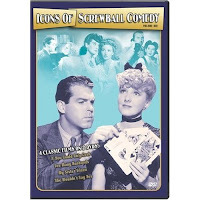 Gordon then desperately tries to cast a French star, Arlette, who is being highly touted by newspaper columnist Bert Keeler (Jack Benny)...and when Arlette dazzles Gordon with an audition, he doesn't even realize it's actually Irene. (If your head is spinning reading this, imagine watching it...) Of course, it all works out in the end. The movie was made before MGM had really found its feet, so to speak, as a musical powerhouse. It's closer in style to the Warner Bros. Busby Berkeley musicals of the early to mid '30s than it is to the great musicals produced by Freed, Pasternak, and Cummings beginning roughly with THE WIZARD OF OZ in 1939. 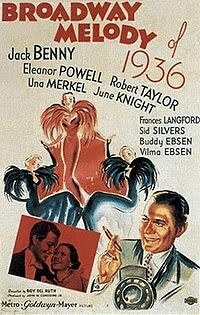 The only problem is, BROADWAY MELODY is not as well executed as the Warners movies, and although there's plenty of MGM gloss, even that doesn't come off with the typical MGM quality: I can only figure they used back projections of extras in the magnificent nightclub set near the end because they needed to do retakes. "I've Got a Feeling You're Fooling" inexplicably, to my mind, won the then-existent Oscar for Best Dance Direction. Although it's fun to hear Robert Taylor sing some of this song -- which was used in THAT'S ENTERTAINMENT II -- the "magic" used in the dance seems to come out of nowhere, and the entire thing, including the dancing, looks clunky. It would have worked better if it was supposed to be part of a stage production in the movie, but it was supposed to be real life! The fact that Jack Benny's character was watching the dance from afar made it even harder to suspend disbelief as costumes magically changed and props appeared and disappeared. Another strange angle is that Gordon (Taylor) spends most of the movie desperately trying to escape the fate of having to cast his backer Lillian (Vincent) in his show -- and then the finale shows her to be a graceful dancer! Viewers also have to suffer through Sid Silvers in drag...don't ask. Now for the good stuff: First, of course, Eleanor Powell. This was Powell's first big starring role, as recounted by Jeanine Basinger in a fascinating chapter of her book THE STAR MACHINE. I'm not sure I recall ever having seen Powell dance in toe shoes rather than tap shoes before, and her ballet number set to "You Are My Lucky Star" was one of the highpoints of the picture. My other favorite scene was the casual rooftop routine Powell performs with Buddy and Vilma Ebsen. Vilma, Buddy's sister, looked like a young Myrna Loy and was absolutely charming. It's a shame that this was her only film. She just passed away in 2007, at the age of 96. (My husband once saw Buddy Ebsen at a party at the Magic Castle, but that's a story for another time...) The dancing by Powell and the Ebsens makes watching the film a must for fans of musicals. 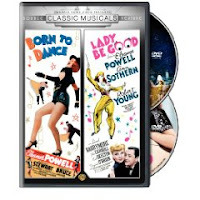 The movie is also worthwhile to help understand the evolution of movie musicals in general and MGM musicals in particular. Robert Taylor has quite a bit of screen time but doesn't really do much that's memorable other than sock Jack Benny several times. Taylor's gorgeous, but I prefer the more weathered Taylor of the late '40s and '50s. Una Merkel adds some zing to the film as Gordon's long-suffering secretary. Frances Langford's lovely voice can be heard singing several songs throughout the film. And, as a side note, I loved the donut shop, including the great sign...those scenes made me hungry! BROADWAY MELODY OF 1936 was directed by Roy Del Ruth and an uncredited W.S. Van Dyke. IMDb says that Van Dyke headed up retakes because Del Ruth had moved on to another film. 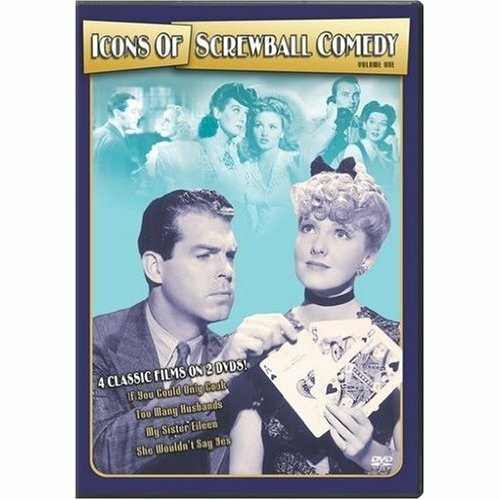 This movie is available on DVD as part of Classic Musicals From the Dream Factory, Volume 3. The black and white print is outstanding. This film can be seen periodically on Turner Classic Movies. The trailer is here. 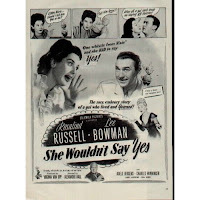 Some reviewers liked this film quite a bit more than I did; I'll watch it again sometime to see if this was an off night for me, but at this point I'd class this as an MGM musical that's a very rare disappointment, though watching it has its compensations. 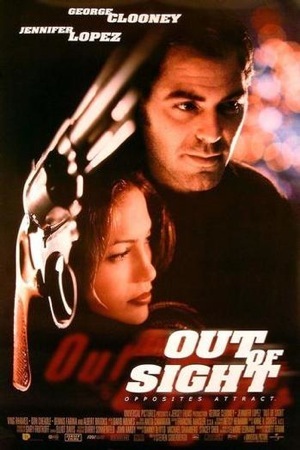 Our Netflix film tonight was OUT OF SIGHT, an interesting look at the attraction between a genial bank robber (George Clooney) and a gutsy, self-possessed federal marshal (Jennifer Lopez). I'd heard good things about the film and found it quite enjoyable, if improbable. Clooney plays a smooth operator who is a variation on his later Danny Ocean character, and the appealing Lopez shows she could have had a much more interesting career than she has developed if she had made better choices after this film. There are two good supporting performances, by Dennis Farina as Lopez's father and Ving Rhames as Clooney's sidekick with a conscience. Michael Keaton hits the mark in a one-scene cameo as Lopez's dense, married FBI flame. The film has a unique story and interesting "nonlinear" editing -- in that regard it reminded me of Clooney's 2007 film MICHAEL CLAYTON. The movie also has an attractive visual style, whether it's the hotel hideout in Florida, Farina's waterfront home, the brake lights illuminating the inside of a trunk, or snow falling outside a Detroit cocktail lounge. My main criticism of this R-rated film is the language and violence. The violence was actually fairly muted, compared to what it could have been, but there were a couple unnecessary screen shots and I would have preferred if the film had maintained a more lighthearted OCEAN'S-style tone throughout. OUT OF SIGHT was directed by Steven Soderbergh, who also directed Clooney's three OCEAN's capers. The supporting cast includes Don Cheadle (also of OCEAN's) as a menacing thug, Albert Brooks as a wealthy ex-con, Catherine Keener as Clooney's ex, and Isaiah Washington (GREY'S ANATOMY) as another crook. Steve Zahn is amusing as a very dense ex-con who knows both Clooney and Lopez. Look for Samuel L. Jackson in a cameo role. The movie runs 123 minutes. It could have used tighter editing towards the end, when Don Cheadle's character was allowed to dominate and the pace grew sluggish, but it maintains viewer interest throughout. Parental advisory: This film is rated R for language, violence, and one love scene. I actually don't think there was much more to it than some PG-13 films I've seen, but it's not for the younger set. OUT OF SIGHT is available on DVD. It also had a VHS release. 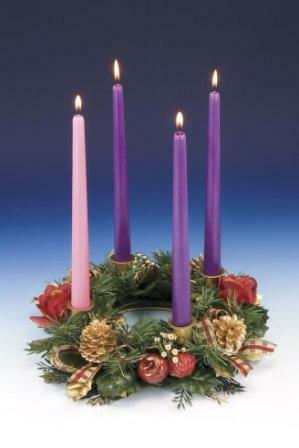 Sincere good wishes to all my readers for a happy and meaningful Advent season. 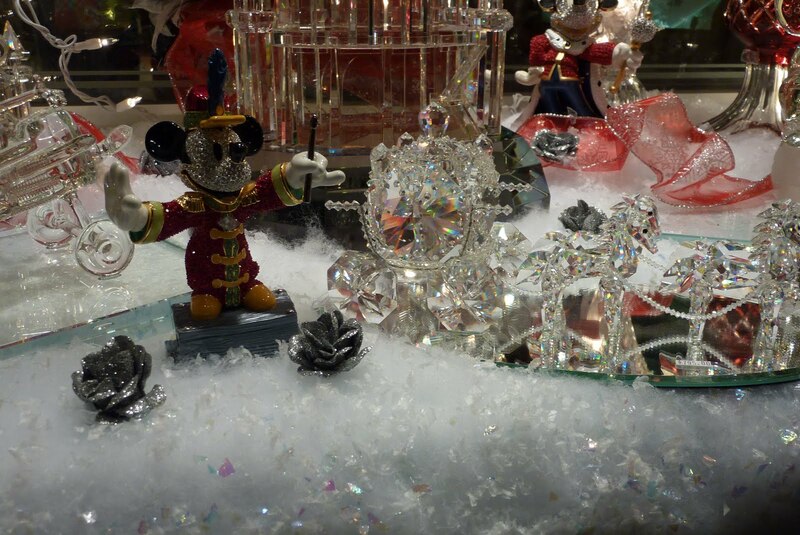 It's hard to believe there's less than four weeks to go till Christmas! ...Here's a nifty new book for the Audrey Hepburn fans on your Christmas list: AUDREY HEPBURN: INTERNATIONAL COVER GIRL. It was just published by Chronicle Books. 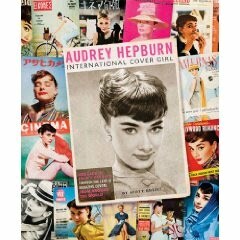 ...Another Audrey book, which came out earlier this year, is CHARMED BY AUDREY: LIFE ON THE SET OF SABRINA. Since I just saw the movie, that sounds like a fun book. 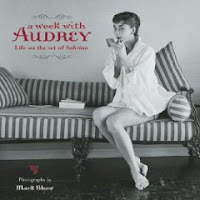 The photos come from 60 rolls of film shot by Life photographer Mark Shaw, which were misplaced for over half a century. ...NPR lists their choices for the 10 Best Cookbooks of 2009... The New York Times reviewed fall releases earlier this month, including THE PIONEER WOMAN COOKS. ...Here's a YouTube video of the Gatlin Bros. singing "Americans, That's Who" on Fox News Channel. That's their longtime guitarist Steve Smith backing them up. The song is on their new album. ...A "LauraPalooza," celebrating all things Laura Ingalls Wilder, is scheduled for next July in Mankato, Minnesota. Mankato is also the home of the Betsy-Tacy books. ...Speaking of Little House, Melissa Gilbert has a Twitter account she uses to share news about the tour of the LITTLE HOUSE musical. It's kind of amusing that she keeps in touch via this method with her TV show costars Dean Butler (Almanzo) and Alison Arngrim (Nellie). 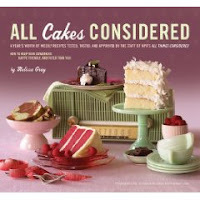 ...For the baker on your Christmas list: ALL CAKES CONSIDERED by Melissa Gray of NPR. It's from Chronicle Books. 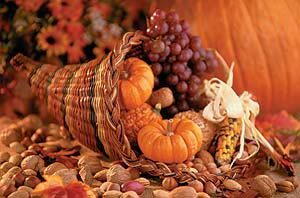 ...Never too late for good food: Here's links for recipes for the Ultimate Thanksgiving Dinner from the late, lamented Gourmet magazine. I've got to try making cider-glazed turkey sometime. ...Jack Cashill of American Thinker contrasts the lives of Sarah Palin and Barack Obama, as told in their autobiographies. It's illuminating. ...Looking for an inexpensive holiday movie to add to your DVD shelf? 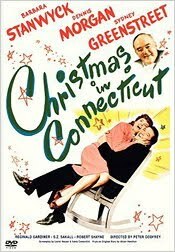 As I write, CHRISTMAS IN CONNECTICUT (1945) is just $5.79 at Amazon. It comes with the highly regarded short STAR IN THE NIGHT (1945), directed by Don Siegel. ...Don't forget the excellent TV-movies ONE SPECIAL NIGHT (1999) and THE CHRISTMAS CARD (2006) this Christmas. Both are available on DVD. ...Mini political roundup: Cal Thomas on "U.S.S.A."... The trio of Michael Barone, John Hinderaker, and Byron York discuss why the Democrats won't give up their disastrous healthcare plan: it's not about healthcare, it's about permanently swelling the size and power of government. ...Victor Davis Hanson writes "Where Has the Thrill Gone?" and concludes "I think not merely the thrill is gone, but a righteous anger about an Obama trifecta — of serial apologies and bows abroad, massive borrowing and deficit spending, and government take-overs of private spheres of life — is swelling up in the electorate. I haven’t seen in my lifetime anything quite like it. And this furor of being had has the potential not just to take Obama down, but also his ideology and supporters along with him for a generation." ...Most TV networks are attempting to ignore ClimateGate -- the exception being Fox News Channel. No surprise there. ...Lucianne.com has started a new website for blog news. ...Notable passing: University of Southern California film professor Herb Farmer has passed away, age 89. Farmer filmed football games, organized the school's film-related archives, and served as Associate Dean of the School of Cinematic Arts during his decades with USC. The enjoyable World War II service comedy OVER 21 provides an excellent showcase for the comedic talents of Irene Dunne. Dunne plays Paula "Polly" Wharton, a best-selling novelist whose newspaper editor husband Max (Alexander Knox) enlists in the Army with the hope of graduating from officers candidate school. Polly moves into a rundown little bungalow to be near Max, making friends with the other wives and adapting cheerfully to a lifestyle that is just one step above camping. As Max struggles through officer candidate school, his publisher boss, Robert Gow (Charles Coburn), is none too happy to lose his star employee and pressures him to resign. Fearing that Gow will sell the paper while Max is in the service, Polly placates the publisher by writing a series of editorials under Max's name. The two big questions hanging over Polly are whether Max will graduate as an officer and whether Gow -- and Max! -- will discover her deception. OVER 21, based on a play by Ruth Gordon, reunited Dunne, Coburn, and director Charles Vidor, who had all worked on TOGETHER AGAIN the previous year. The lead role gives Dunne the chance to shine, whether it's her never-ending font of one-liners or some funny physical comedy, such as her attempt to turn out the living room light. It's a good part which includes a couple touching dramatic scenes as well. Dunne is always a pleasure to watch, and this film is no exception. Knox is well cast as the older-than-typical officer candidate, a "four eyes" who is book smart but struggles through the physical training and engineering classes. He and Dunne are believable as a married pair of writers. The film has a good supporting cast, starting with Jeff Donnell and Loren Tindall as the young couple moving out of Dunne's bungalow at the start of the film. Phil Brown (later known as Uncle Owen in STAR WARS) plays the star student in Max's class. Lee Patrick, Cora Witherspoon, and Charles Evans also appear in the film. There are a number of attractive young players cast as Dunne's fellow army wives, including Ann Loos. OVER 21 was filmed in black and white by Rudolph Mate, who later became a director of films such as SALLY AND SAINT ANNE (1952). It runs 102 minutes. This film has not had a VHS or DVD release. It's a Columbia film which has been shown on Turner Classic Movies. Update: This movie is now available on DVD-R from Columbia Classics. EYE WITNESS, a relatively little-known mystery starring Robert Montgomery, comes to DVD on February 23, 2010. The movie was made in England and was titled YOUR WITNESS in the UK. 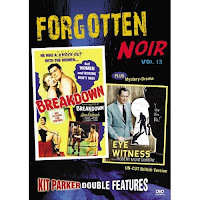 It's being released as the 13th entry in VCI's Forgotten Noir series. 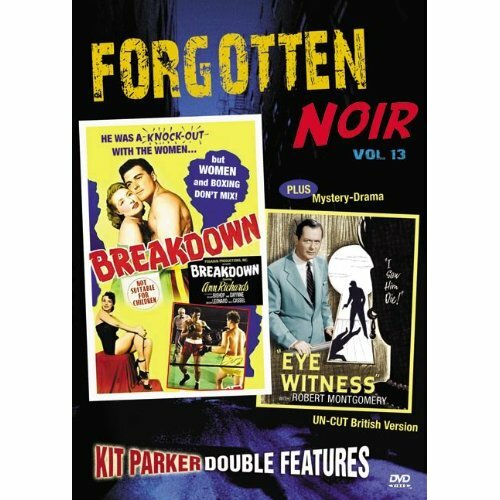 EYE WITNESS is part of a double feature set which also includes the 1952 film BREAKDOWN. I've read a couple brief reviews indicating that EYE WITNESS is quite good. 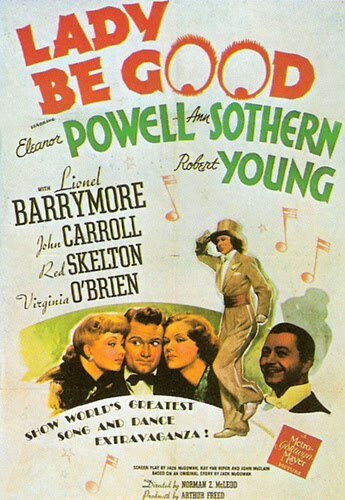 It was produced by longtime Hitchcock associate Joan Harrison, who also produced Montgomery's RIDE THE PINK HORSE (1947) and ONCE MORE, MY DARLING (1949). Montgomery plays an American attorney who travels to England to help clear a friend of murder, and has to deal not only with finding the title character but navigating the unfamiliar British legal system. Leslie Banks and Felix Aylmer costar. This movie sounds really interesting; as a Montgomery fan, it's a "must buy" for me. Oh, my...my day was made when I discovered that at long, long last, the first POLDARK series is coming to DVD next March. TV Shows on DVD had the good word (click the title of this post). It will be out on March 2, 2010, and is already available for preorder at Amazon. The cover art is lovely! It's also listed at Deep Discount at a substantially lower price. I had almost given up hope of the show coming out on U.S. DVD. The only reason I hadn't yet bought a Region 2 copy, as I mentioned a few months ago, is concern that some of the episodes released in Britain had been edited. I'll be able to discard a lot of Beta tapes when this comes out... Hopefully a release of POLDARK II won't be long behind. 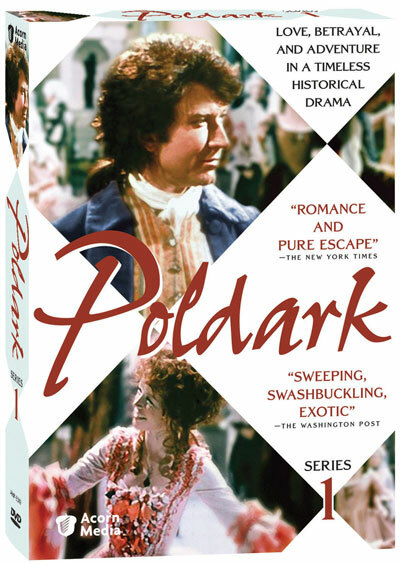 POLDARK, which first aired in England in 1975, stars Robin Ellis and Angharad Rees in an exciting tale of adventure and romance, set on the Cornish coast in the late 1700s. Ralph Bates, Jill Townsend, Clive Francis, and Judy Geeson also star. I first saw the series when it ran on PBS in the late '70s. The show is based on the first four novels of Winston Graham's POLDARK series, which I also raced through during my high school years. Graham wrote the books over a span of several decades, beginning in the 1940s. POLDARK II is based on novels five through seven. There were ultimately twelve books in the series, although unfortunately the later books were never filmed with this cast. A 1996 TV-movie based on some of the later books, made with a completely different cast, is by all accounts best left forgotten. More info is available at the Winston Graham and Poldark Literary Society website. There is also an extensive post on Wikipedia, although those who are unfamiliar with POLDARK should be aware it's filled with spoilers. This is great news for fans of classic British television. March 2010 Update: More good POLDARK news -- POLDARK II will be released on DVD on September 28, 2010. 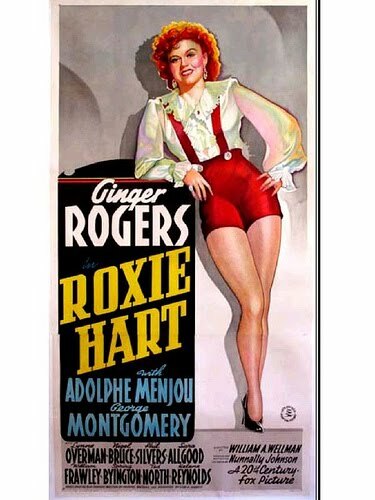 The story of ROXIE HART will be instantly familiar to anyone who's seen the musical CHICAGO. 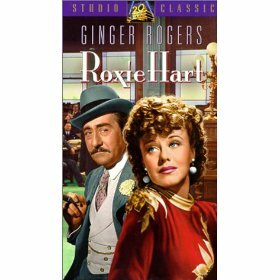 Would-be entertainer Roxie (Ginger Rogers) rises to fame and notoriety when she goes on trial for murder. This being the era of the Production Code, the storyline is neatly worked out so that Roxie pleads guilty but is not really a murderess. Otherwise, the antics of Roxie and her manipulative attorney, Billy Flynn (Adolphe Menjou), go along as expected. The script by Nunnally Johnson and an uncredited Ben Hecht was based on the original play CHICAGO by Maurine Dallas Watkins, and for the most part it's quite amusing, especially given the film's talented cast. Lynne Overman is very funny as newspaper reporter Jake, who launches Roxie on the path to fame. George Montgomery is Homer Howard, a lovestruck reporter, and Spring Byington is gossip columnist Mary Sunshine. William Frawley is the jury foreman, with Phil Silvers a newspaper photographer and George Chandler Roxie's put-upon husband, Amos. The cast also includes Nigel Bruce and Sara Allgood. George Lessey does a good job as the Judge, who constantly interrupts his solemn duties to pose for pictures. If you look carefully, that's a young Hugh Downs playing the reporter who comes into the bar with George Montgomery and listens to his tale. Helene Reynolds plays Velma, the character played by Catherine Zeta-Jones in the 2002 movie, but she only has a brief scene. Iris Adrian is another jailed murderess, Two Gun Gertie. Although the movie stars Ginger Rogers, it's mostly a comedy, not a musical. However, there are two brief musical numbers, including a solo Roxie performs for Homer in the jail accompanied only by the faint sound of a drum. Ginger is excellent as the gum-chewing, mercenary Roxie, especially during the big scene where she takes the stand, weeping, batting her eyelashes, and hitching her skirt up above her knee. Menjou is also quite funny in this scene, silently mouthing the words he's rehearsed with Roxie. It's not a perfect film and is a bit draggy in spots, but all in all this is a fun movie. An interesting side note, this story has a long history. It was first filmed as a silent movie in 1927, called CHICAGO, with Phyllis Haver starring as Roxie Hart. 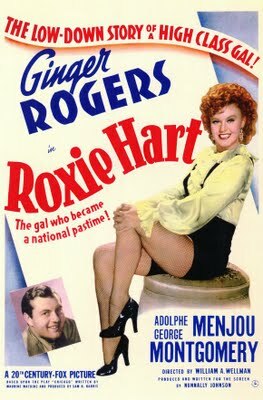 ROXIE HART was directed by William A. Wellman. Although ROXIE HART is satire, the flashbacks and murder trial in a Roaring '20s setting reminded me of Wellman's MIDNIGHT MARY (1933), starring Loretta Young. The irreverent take on the press's love for a sob story also calls to mind Wellman's NOTHING SACRED (1937). The movie was shot in black and white by Leon Shamroy. It runs a quick 75 minutes. 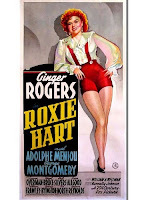 ROXIE HART has been released on DVD and VHS. It can also be seen from time to time on Fox Movie Channel. 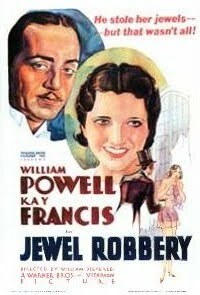 JEWEL ROBBERY is an unusual film about an elegant jewel thief (William Powell) and his willing victim, a wealthy but unhappily married Baroness (Kay Francis). This very entertaining movie features two great stars in the lead roles in a fast-paced and occasionally surprising film. The excellent script gives Powell and Francis irreverent and sometimes startling dialogue. 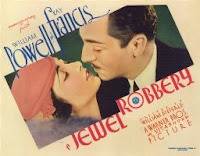 The movie's wit and romance gives it the feel of an Ernst Lubitsch film, particularly TROUBLE IN PARADISE, a Kay Francis film about jewel thieves released the same year as JEWEL ROBBERY. This is very much a pre-Code film, including the method Powell sometimes uses to subdue his victims: he gives them marijuana cigarettes. Although on the whole I found the film quite enjoyable, I didn't care for that particular plot angle; I found it distasteful and too far "out there." It also must be said that while the characters are elegance personified, there isn't a "good" character in the bunch...everyone is greedy, unfaithful, or a criminal. 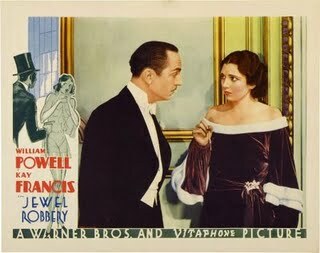 However, this is something of a fairy tale, and as such it's easy to root for the friendly thief and the bored Baroness; the very pre-Code ending is quite wonderful. Depression-era audiences doubtless loved the fantasy of the idle rich not being very happy! That's a recurring theme in Depression-era films, including many screwball comedies. As always, Francis looks amazing, starting with the first shot of her character in a gigantic bubble bath. I'm not sure if the gown she wears in the last section of the movie is meant to be a nightgown, but whatever it was, it was something else. Francis had wardrobes like no one in the movies before or since. The supporting cast includes Helen Vinson as Teri's friend and Henry Kolker as Teri's husband. Hardie Albright, Alan Mowbray, and Charles Coleman are also in the cast, with Coleman playing -- what else? -- Powell's butler. 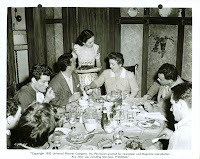 Ruth Donnelly has a very funny scene as Francis's maid. JEWEL ROBBERY was directed by William Dieterle. It runs 70 minutes. This film has not had a DVD or VHS release. It can be seen on Turner Classic Movies, which has the trailer available here. Reviews by other bloggers (spoiler alert): The Classic Maiden and She Blogged By Night. Recommended for anyone who loves the stars or is interested in a fascinating example of filmmaking in the pre-Code era. 2012 Update: JEWEL ROBBERY is now available on DVD in the Forbidden Hollywood Vol. 4 Collection from the Warner Archive. We spent a few hours at Disneyland late this afternoon. Happily, there was plenty of parking, the tram was uncrowded, and there wasn't a line to enter the park. However, once we were inside we found it was quite crowded! I suspect the local "after school and work" crowds mostly stayed home, but there were plenty of guests who had probably been in the park all day. 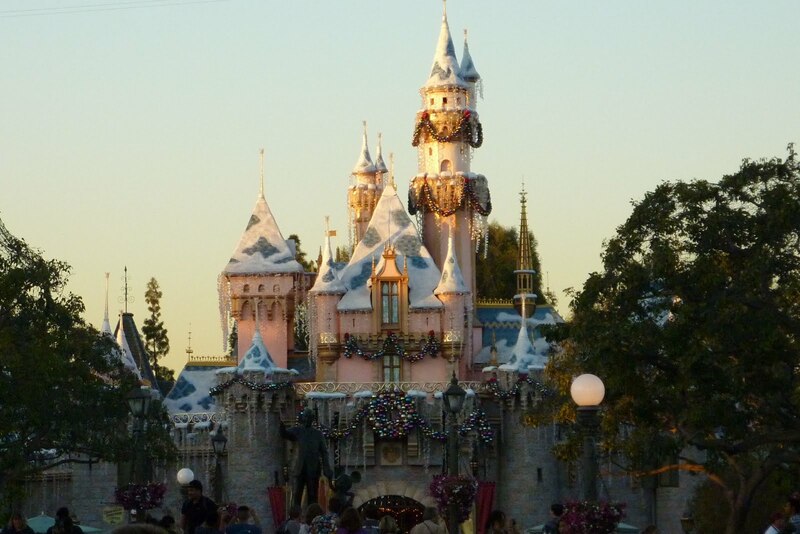 I love Disneyland year 'round, but there's just nothing like visiting Disneyland at this time of year. Christmas is one month from today! Songwriting team Dixie Donegan (Ann Sothern) and Eddie Crane (Robert Young) fall in and out of -- and in and out of! -- marriage as they rise to the top of the music charts in LADY BE GOOD. This black and white musical from 1941 is one of MGM's lesser-known titles, but it's marvelous entertainment. I hadn't seen it since a screening at L.A.'s Vagabond Theater in the '70s, and I somewhat uncharacteristically -- being a huge fan of MGM musicals -- didn't remember anything about it. I was delighted to discover anew how much fun is packed into the movie's 111 minutes. The entertainment value starts with the cast: in addition to Sothern and Young, who always offer smooth, solid performances, top-billed Eleanor Powell plays Sothern's best friend. John Carroll, MGM's wartime substitute for Clark Gable, plays a crooner also mixed up in the goings-on; for those who are curious, Carroll does his own singing. Red Skelton is a "song-plugger" who works to turn Dixie and Eddie's songs into hits, and Virginia O'Brien plays his stone-faced girlfriend, who nonetheless can put over a song with the best of them. Lionel Barrymore has a delightful role as an exasperated divorce court judge with a fondness for musical theater. The film also features the Berry Brothers, a dancing trio who contribute a couple of mind-blowing specialty dance numbers. Their splits and other great moves are reminiscent of the Nicholas Brothers. The Berrys only appeared in a couple other movies. Then there's the music: the title song and "Fascinatin' Rhythm" by the Gershwins; a batch of tunes, including "You'll Never Know," by Nacio Herb Brown and the film's producer Arthur Freed; and Kern and Hammerstein's "The Last Time I Saw Paris." "The Last Time I Saw Paris" won the Academy Award for Best Song. It's given a lovely rendition by Ann Sothern, accompanied by film clips of the city's famous sights. Hearing this song in a movie actually produced when WWII was raging in Europe gives the sequence real poignance. The film includes a splendid montage showing the marketing of the title song as it climbs up the charts. And as for "Fascinatin' Rhythm," probably all that needs to be said is that it's staged by Busby Berkeley. The number starts out with a great vocal by Connie Russell and segues into a Berry Brothers dance routine. Then a pair of tapping feet signal Eleanor Powell's arrival on stage for the grand finale. It's a terrific number. Earlier in the film Powell has a delightful routine with a very smart little dancing dog. (An article at TCM says Powell trained the dog herself.) Powell also has a nice flair for comedy and a dazzling smile which lights up the screen. Her career would take a backseat when she married Glenn Ford a couple years later; their son Peter was born in 1945. The supporting cast includes Dan Dailey (then billed as Dan Dailey Jr.), Reginald Owen, Rose Hobart, and Phil Silvers. LADY BE GOOD was directed by Norman Z. McLeod. It was filmed by George Folsey and Oliver Marsh. The movie has also had a VHS release. LADY BE GOOD can be seen on cable on Turner Classic Movies, which has the trailer available here. Recommended for musical fans. They don't make 'em like they used to, that's for sure. 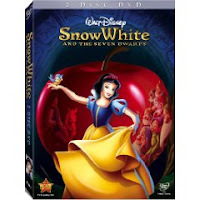 A new edition of Disney's classic SNOW WHITE AND THE SEVEN DWARFS is released on DVD today. In a marketing move that was a bit confusing, a Blu-Ray edition was released in early October. I'm still trying to confirm how many of the new extras on the Blu-Ray release are on today's standard DVD release. Ultimate Disney posted a detailed review of the Blu-Ray edition and compared it to the previous outstanding Platinum release. Most of the extras on the Blu-Ray edition are new, and hopefully that is also the case with the standard DVD. 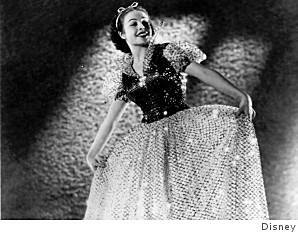 Earlier this month the San Francisco Chronicle published a short but interesting interview with dancer Marge Champion, who worked for two years as the model for Snow White. Good news for fans of classic film in general, and musicals in particular: Leslie Caron's autobiography, THANK HEAVEN, will be released later this week. The book's publication date is November 25, 2009. Caron's book should be very interesting. The stories she tells in DVD interviews (i.e., AN AMERICAN IN PARIS) about her experiences as a young ballerina, transitioning from war-torn Paris to Hollywood, are fascinating. Caron currently operates a bed and breakfast in France. Wouldn't a visit be wonderful? Historial romance author Patricia Veryan has passed away. She was a few days short of her 86th birthday. Veryan was considered by many to be the successor to Georgette Heyer. Veryan's many books are available from Amazon. My favorite title to date is LOVE'S DUET. It has been years since I read it, but I remember marveling at the elegance of Veryan's writing and how every single word really mattered. 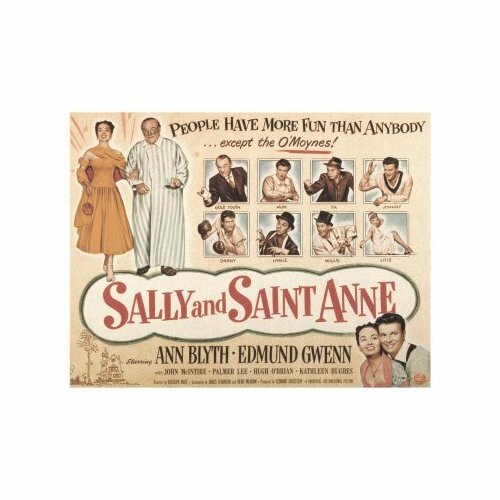 SALLY AND SAINT ANNE is a movie I loved watching on TV when I was growing up. Since then it seems to have disappeared from the airwaves. I've been looking for it this year and tonight I was able to see it again for the first time in decades. It's the movie equivalent of comfort food -- nothing notably special, but the boisterous O'Moyne family are good company. Watching the film again, I could see why it had appealed to me so much when I saw it years ago. It's a most enjoyable little movie. 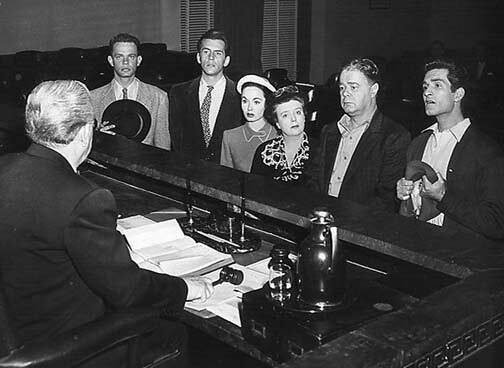 Sweet Sally O'Moyne (Ann Blyth) lives in a small town with her parents (Frances Bavier and Otto Hulett) and her wacky older brothers (Jack Kelly, Hugh O'Brian, and Lamont Johnson). Sally's Grandfather Ryan (Edmund Gwenn), who has been "dying" for 20 years, spends his days in an upstairs bedroom. As she grows up, Sally acquires a reputation around town for her willingness to ask Saint Anne's intercession for her friends' prayer requests. Sally's faith is particularly tested when mean Goldtooth McCarthy (John McIntire) tries to turn the O'Moynes out of their family home. 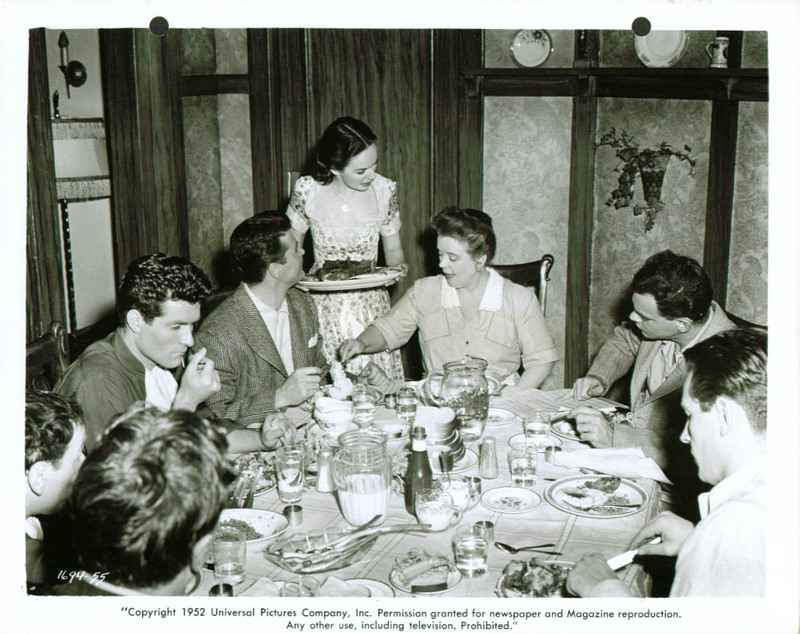 And on a romantic front, how can Sally attract the attention of college man Johnny Evans (Gregg Palmer, then known as Palmer Lee) away from Lois (Kathleen Hughes), a haughty Bostonian who moves to town? That's pretty much all there is to the movie, an uncomplicated comedy about love of God, family, and home. The O'Moynes are a warm, loving, and slightly goofy family, a dynamic which is nicely underscored when a smitten Johnny takes Grandpa's advice and moves in with the family in order to court Sally. Johnny fits right in with the crazy bunch. Ann Blyth is lovely in the title role, and the presence of some familiar TV faces adds to the fun. Frances Bavier, who plays Mrs. O'Moyne, is best known as Aunt Bee from THE ANDY GRIFFITH SHOW. Hugh O'Brian was three years away from playing WYATT EARP when he played Danny, the boxing brother who has taken a few hits to the head too many. Jack Kelly, who plays Mike, an aspiring magician, was still half a decade away from his starring turn with James Garner on MAVERICK; seeing Kelly as "The Great O'Moyne," constantly shuffling decks of cards for his magic tricks, almost seems like a preview of Kelly's role as one of TV's most famous poker players. The film includes a very memorable sequence in which the O'Moyne house is jacked up and moved. Sally, arriving home from a dance, finds her house has left without her and follows it down the street, then climbs the front steps and walks inside as it slowly creaks along on its way. That's a scene which has stayed with me all these years. The supporting cast includes King Donovan, Dabbs Greer, George Mathews, and Alix Talton. Perennial bit player Bess Flowers can be spotted at the country club dance. 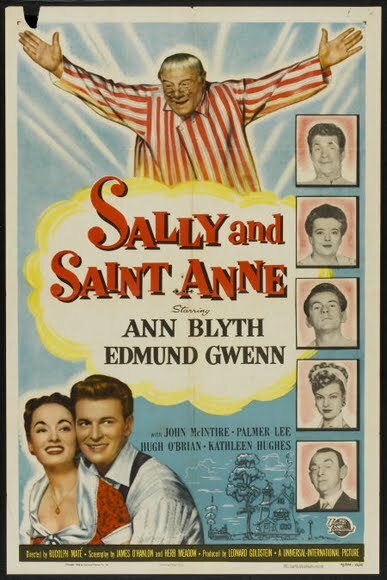 SALLY AND SAINT ANNE was directed by Rudolph Mate. It was shot in black and white and runs 90 minutes. 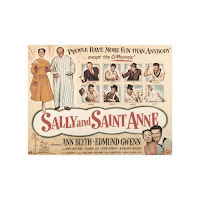 SALLY AND SAINT ANNE is recommended as solid family fun, the kind of wholesome, pleasant entertainment which is a rarity in Hollywood these days.